Cuban programmers have unveiled a new 3D video game that puts a distinctly revolutionary twist on gaming, letting players recreate decisive clashes from the 1959 uprising in which many of their grandparents fought. Fight your way through swamps shoulder-to-shoulder with bearded guerrillas clad in the olive green of Fidel Castro and Ernesto "Che" Guevara. Your mission: topple 1950s Cuban dictator Fulgencio Batista. Out to foil you are Batista soldiers and police who pop out from behind trees and fire from trucks and farmhouses. You pick them off with a vintage Colt .45 or Springfield rifle. If you're hit three times, it's revolution over. "The player identifies with the history of Cuba," said Haylin Corujo, head of video game studies for Cuba's Youth Computing Club and leader of the team of developers who created Gesta Final – roughly translated as "Final Heroic Deed". "You can be a participant in the battles that were fought in the war from '56 to '59." The game begins with the user joining the 82 rebels who in 1956 sailed to Cuba from Mexico aboard the Granma. After a brief description of the landing – a spectacular disaster that very nearly derailed the rebellion when three-quarters of the Granma's passengers were killed – you find yourself wading through the wetlands of south-eastern Cuba surrounded by fellow guerrillas identifiable by the black and red armbands of the revolutionary movement. The keyboard-operated game has five levels, most named after battles like La Plata and El Uvero, and the scenery is full of ancient vehicles and the ferns, canebrakes and mountain trails typical of the Cuban countryside. A soundtrack of gunshots and explosions accompanies the action. 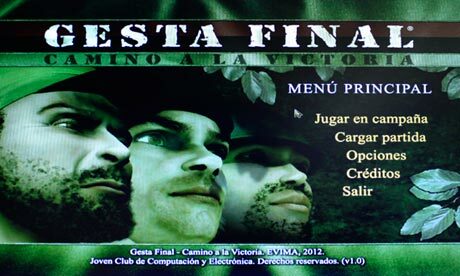 The gamer never reaches the palace to take on Batista, as the main goal is to survive through to level five, which recreates the key second battle of Pino del Agua months before Batista's departure. The game lets you pick from three player profiles, one in an olive hat similar to the one Fidel Castro was known for, another wearing a Guevara-style beret and the last with the kind of helmet worn by the ill-fated Camilo Cienfuegos in many revolution-era photographs. Programmers said that they're not meant to be exactly like the three famed rebel commanders. "We didn't want the characters to identify any revolutionary leader, but we did want it to frame the moment," Corujo said.